Love Photography? Love F1 racing? Love Photography AND F1 racing? If the answer of any of these 3 questions is "YES!!!" 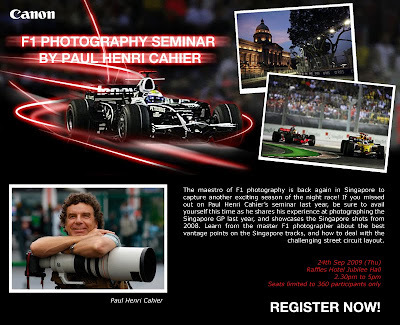 and you are available on Sept 24, do sign up for the Canon-sponsored F1 Photography Seminar with famous F1 photographer Paul Henri Cahier at Raffles Hotel. Learn from the master photographer about the best vantage points on the Singapore tracks , and how to deal with the challenging street circuit layout. Hurry and register now. Seats are limited to 360 participants only.